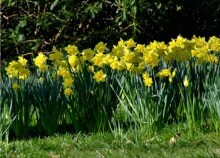 About Brewster in Bloom...In the mid-1980’s, a group of business people planted hundreds of daffodils along Rt. 6A in Brewster to mark the beginning of spring. What a sight to see after a long, cold, gray winter! From this, the Brewster in Blooms festival was born. The 3-day festival was organized to celebrate spring, bring residents and visitors to town and offer free events. But the more important charitable cause of the festival is to raise money for the community. The early festivals funded the construction of the band-stand at Drummer Boy Park. Since then, proceeds benefit the Brewster in Bloom grant program providing scholarships for Brewster students and donations to the Elder Brewster Scholarship Fund. $5,000 per year is invested in the program. Main Events Include: CAPTAINS GOLF COURSE CLOSEST TO THE PIN CONTEST…Friday, Saturday and Sunday: 7:30 am – 1:30 pm Freeman’s Way. 5 Ways to Win! On the Green; Closest to the Pin; Closest for the Day; Closest "Closest" to the Pin; and Daily Raffle. 6th ANNUAL ANTIQUES & ARTS EXCURSION…Friday, Saturday and Sunday: 10:00 am to closing. A self-guided tour of Brewster’s numerous antique and art galleries. Please see individual gallery listings for exact days, times and offers! BREWSTER BAND CONCERT…Friday at 7:00 pm: Brewster Baptist Church, 1848 Main Street. A free will offering will be collected to support the Band. FREE! JURIED FINE ARTS & CRAFTS SHOW...Saturday 10:00 am - 5:00 pm and Sunday 10:00 am - 4:00 pm: on the grounds of Cape Cod Sea Camps, 3057 Main Street with more than 90 vendors (Click here for the list of vendors). Free admission and parking. CAPE COD 5 - 5K BLOOM RUN…Saturday at 10:00 am: Starts at the Brewster Inn and Chowder House, 1993 Main Street. Registration opens 8:30 am. To register in advance visit www.brewsterrecreation.com. KID FEST AT DRUMMER BOY PARK…Saturday from 10:00 am – 3:00 pm, 773 Main Street featuring Brewster’s youth groups hosting activities for families with children. Touch-a-Truck, Bounce House, Dance Floor and DJ, Golf Ball Drop, food concession and much more! (There is a $5 admission to Nauset Youth Alliance activities.) BREWSTER INN/WOODSHED BLOOMIN’ PARADE…Sunday - steps off at 1:00 pm from Eddy Elementary School west on Main St. to Swamp Rd. – staging begins at 12 Noon at the Eddy Elementary School. This year’s theme is “Sea Captains & Treasure”.